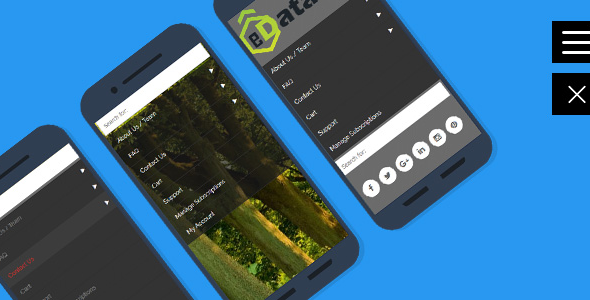 EDS Responsive menu is a responsive WordPress menu plugin that generates area economical vertical, horizontal push/sliding/static navigation, icon toolbar or fullscreen menu on your choice. It will be used as standalone navigation or compliment your main menu. eds Responsive menu makes navigation much user-friendly and easier each on desktops and mobiles. idea of slide in vertical, horizontal menu that tried itself on mobiles currently shines on desktops too! It may be used as always visible navigation as well. Create your custom WordPress menu in a few easy steps. eds Responsive menu allows you to easily and intuitively create a slick and professional WordPress menu. From the most complex "Mega Menu", rich with features, down to the simplest of menus with simple drop-downs, siding.